As non-profits, your work already matters – you aren’t just selling another gadget. Building consistency between every objective and plan right down to how you acknowledge (or don’t acknowledge) people is how you make your brand matter. And all that starts with your day-to-day communications. Use the following 3 principles to help you embed what you actually do, into your emails, social media posts, posters, staff notices, and whatever else you’re using. Whether your audience includes the employees, board members, or volunteers inside your organization, or the community supporters outside, how things look matters. According to a study done by 3M – the Post-It Note geniuses – visuals are processed 60 000 times faster than text. In an age where the average person views upwards of 5000 ads every day (not including emails, tweets, posts…), it’s no understatement to say that every person looking at a piece of communication from you is already maxed out. What you need to do: Make it easy. Using the same logo and color scheme matters. People connect with the colours you use. Consistency between the colours you use for infographics, letterheads, email signatures…all of that helps people unconsciously link information to your organization. And that link holds even if what they see is on Facebook, Twitter, a bus bench, or on a poster at the community hall. Words are what will build a personal relationship with the people you are trying to reach. They are what help people see why your work is important for you and for them. Make sure you include your purpose as one of the first things that people will notice. Go ahead and add a short-version of your organization’s purpose (around 5 words) to your email signature or letterhead as a subtle way to help people connect who you are with what you do. Great stories are like healthy food for your brand: they strengthen it from the inside out. 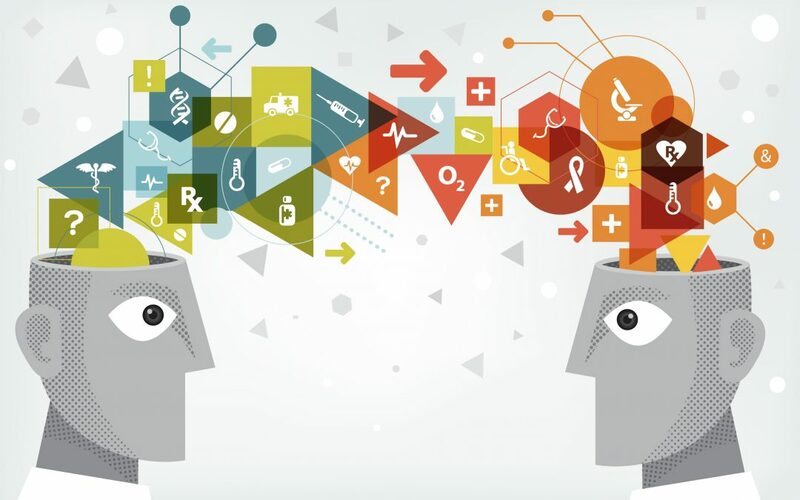 When you find, collect, and broadcast stories, you help make your brand’s identity stick in people’s minds. Read Step #1 in our previous post. The stories you choose to tell and retell communicate your values – what’s important to you – and they shape the way people start thinking about your work (and their own work if they are organization insiders). But maybe, more importantly, great stories are a great place to start a conversation. They’re relatable, entertaining, emotional, and they invite connection. So, in your next social media post, tell a specific story about how your work has changed someone’s life. In your next staff meeting, ask someone to share a “win” they experienced in their role lately. Start taking pictures around the office and at your events, and use these to create a themed storyboard that you post online, in your staff room, or share in your annual report. It’ll be easier for people to connect with your organization when you provide them a narrative to tie it all together. Here’s an example from Safe Harbour where they invite you to read Buddy’s story right on the homepage of their website – they know the impact a great story can have! Beginning with this kind of plan helps you in lots of ways. First, because you know what you want your audience to do, you can ask the question: “Did they do it?” If they did, then you can figure out what you did right (and repeat, repeat, repeat). If they didn’t, you can figure out what went wrong and work on a different plan. Next, this plan will help you learn to connect your purpose with your communication. Often organizations get really good at reaching out through one or two channels. They have a great website or use Facebook ads really effectively. 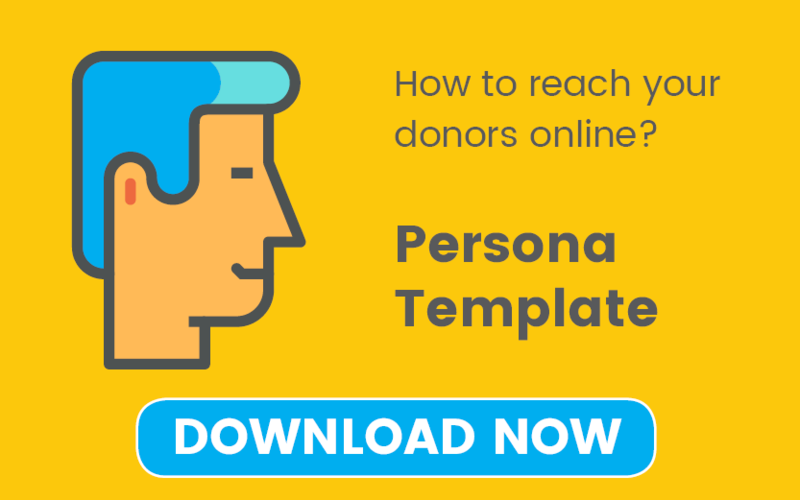 To expand that reach, non-profits must look at how they can share their purpose in their newsletters. Or their quarterly reports. Or their next mail-out. Pick one area you know you can improve, and use the above steps to start improving. 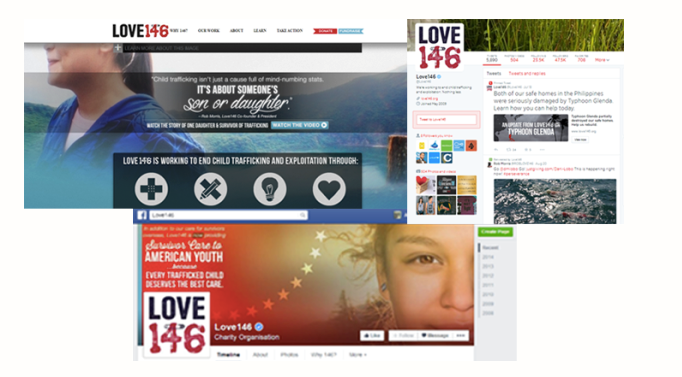 Love146 envisions a world free from human trafficking. Their offices are in the United States and the Philippines, and they offer survivor care, preventive education, and professional training while working to connect and empower local abolition movements. Love146 has a color story. Red, gray, and black are repeated over and over in the images they use. 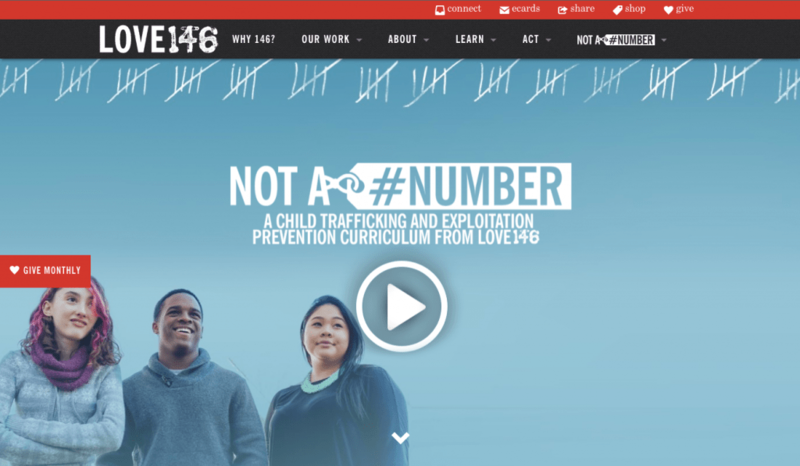 Love146 is focused on empowering and strengthening children in a fiercely dark situation. Red for power, gray for uncertainty, and black for darkness – logical choices. What’s beautiful is the contrast introduced by azure blue. It symbolically turns focus toward brighter skies ahead. Photos on Love146’s website and social media pages center on children. Again, this makes sense and reinforces for viewers who the organization serves. 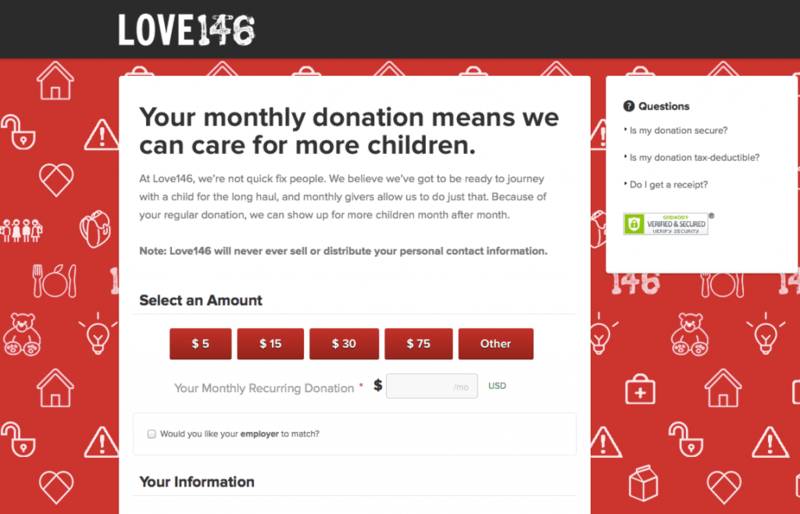 On their donation page, Love146 provides a simple format with easy access to any questions potential donors may have. “Your monthly donation means we can care for more children” is a clear message that explains why their donation page is set up how it is. When you look at the background, you see pictures of houses, food, and representations of comfort and safety. These words and images spread the rational and emotional message of Love146 in a coherent and consistent way. The strength of your brand, your ability to reach your audience, and the impact your non-profit achieves are all connected. Incorporating solid design, great stories, and a clear purpose into your day-to-day communications is crucial – even non-negotiable – if you want to stand out and further your cause.